The use of terrestrial LiDAR (light detection and ranging) scanners in forest environments is being studied extensively at present due to the high potential of this technology to acquire three-dimensional data on standing trees rapidly and accurately. This article aims to establish the state-of-the-art in this emerging area. Terrestrial LiDAR has been applied to forest inventory measurements (plot cartography, species recognition, diameter at breast height, tree height, stem density, basal area and plot-level wood volume estimates) and canopy characterisation (virtual projections, gap fraction and three-dimensional foliage distribution). These techniques have been extended to stand value and wood quality assessment. Terrestrial LiDAR also provides new support for ecological applications such as the assessment of the physical properties of leaves, transpiration processes and microhabitat diversity. Since 2003, both the capabilities of the devices and data processing technology have improved significantly, with encouraging results. Nevertheless, measurement patterns and device specifications must be selected carefully according to the objectives of the study. Moreover, automated and reliable programmes are still required to process data to make these methodologies applicable specifically to the forest sciences and to fill the gap between time-consuming manual methods and wide-scale remote sensing such as airborne LiDAR scanning. 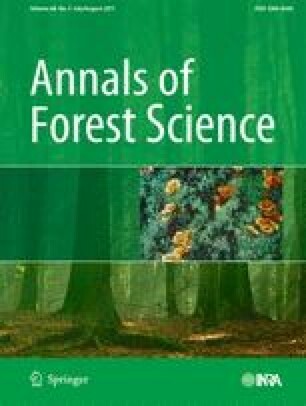 This work was supported by the French National Research Agency (ANR) through the EMERGE project (ANR BIOENERGIE 2008 BIOE-003), which aims at establishing reliable and generic distribution models of tree biomass. It is managed by Christine Deleuze. The authors also thank referees for their useful and constructive comments. Bélouard T., Vidal C., Hervé J.C., and Robert N., 2005. The new French forest inventory, a systematic and annual sampling. De l'observation des écosystèmes forestiers à l'information sur la forêt, 2nd-3 rd February 2005, Paris. Available online at http://www.symposcience.org/exl-doc/colloque/ART-00002046.pdf. Last accessed 28 January 2011. Bienert A., Maas H.G., and Scheller S., 2006a. Analysis of the information content of terrestrial laser scanner point cloud for the automatic determination of forest inventory parameters. Workshop on 3D Remote Sensing in Forestry, 14th-15th Feb 2006. Vienna. Available online at http://www.tu-dresden.de/ipf/photo/publikationen/2006/Bienert_Maas_Scheller_ForestryVienna2006.pdf. Last accessed 28 January 2011. Bienert A., Scheller S., Keane E., Mullooly G., and Mohan F., 2006b. Application of terrestrial laser scanners for the determination of forest inventory parameters. Image Engineering and Vision Metrology. ISPRS Commission V Symposium, WG 3, Dresden, 25–27 September 2006 36, Part 5. Available online at http://www.isprs.org/proceedings/XXXVI/part5/paper/1270_Dresden06.pdf. Last accessed 28 January 2011. Bienert A., Scheller S., Keane E., Mohan F., and Nugent C., 2007. Tree detection and diameter estimations by analysis of forest terrestrial laser scanner point clouds. Laser scanning 2007 and Silvilaser 2007. ISPRS Commission III Workshop 36, Part 3, Espoo, Finland. Sept. 12–14, 2007. Available online at http://www.isprs.org/proceedings/XXXVI/3-W52/final_papers/Bienert_2007.pdf. Last accessed on 28 January 2011. Binney J. and Sukhatme G.S., 2009. 3D tree reconstruction from laser range data. In: Proc. of the 2009 IEEE international conference on Robotics and Automation. Available online at http://cres.usc.edu/pubdb_html/files_upload/598.pdf. Last accessed on 28 January 2011. Danson F.M., Armitage R.P., Bandugula V., Ramirez F.A., Tate N.J., Tansey K.J., and Tegzes T., 2008. Terrestrial laser scanners to measure forest canopy gap fraction. SilviLaser 2008, 17th-19th September 2008. Edinburgh, UK. Available online at http://geography.swan.ac.uk/silvilaser/papers/oral_papers/Terrestrial Laser scanning & Laser Cameras/Danson.pdf. Last accessed 28 January 2011. FARO, 2010. Available online at http://www.faro.com. Last accessed 28 January 2011. Zoller + Fröhlich, 2010. Available online at http://www.zf-laser.com. Last accessed on 28 January 2011. Hosoi F., and Omasa K., 2009b. Estimating vertical leaf area density profile of tree canopies using three-dimensional portable LiDAR imaging. In Proceedings of the ISPRS workshop Laser-scanning 09, Paris, France. pp. 152–157. Available online at http://www.isprs.org/proceedings/XXXVIII/3-W8/papers/p55.pdf. Last accessed 28 January 2011. RIEGL Laser Measurement Systems (2010) Available online at http://www.riegl.com. Last accessed 28 January 2011. Lemmens M., 2009. Terrestrial laser scanners. GIM International. 8 (August 2009): 62–67. Available online at www.gim-international.com/productsurvey/id34-Terrestrial_Laser_Scanners,_August.html. Last accessed 28 January 2011. Optech Incorporated, 2010. ILRIS-3D and ILRIS-36D technical overview. Available online at http://www.optech.ca. Last accessed 28 January 2011. Pfeifer N. and Briese C., 2007. Laser scanning - Principles and applications. Institute of Photogrammetry and Remote Sensing, Publication database of the Vienna University of Technology, Austria. Available online at http://publik.tuwien.ac.at/files/pub-geo_1951.pdf. Last accessed 28 January 2011. Pfeifer N. and Winterhalder D., 2004. Modelling of tree cross sections from terrestrial laser-scanning data with free-form curves. ISPRS - Int. Arch. Photogramm. Remote Sens. Spat. Inf. 36 (8 / W2): 76–81. Available online at http://www.isprs.org/proceedings/XXXVI/8-W2/PFEIFER.pdf. Last accessed 28 January 2011. Pfeifer N., Gorte B. and Winterhalder D., 2004. Automatic reconstruction of single trees from terrestrial laser scan data. In: Proc. of the 20th ISPRS Congress, Commission 5, Istanbul, Turkey, \July 2004. Available online at http://www.citg.tudelft.nl/live/binaries/3b390ae2-9b55-4cbc-8255-da55928dd925/doc/automatic reconstruction.pdf. Last accessed 28 January 2011. Simonse M., Aschoff T., Spiecker H. and Thies M., 2003. Automatic determination of forest inventory parameters using terrestrial laserscanning. In: Proc. of the ScandLaser Scientific Workshop on Airborne Laser Scanning of Forests, Umea, Sweden, pp. 251–257. Available online at http://www.natscan.uni-freiburg.de/suite/pdf/030916_1642_1.pdf. Last accessed 28 January 2011. Thies M. and Spiecker H., 2004. Evaluation and future prospects of terrestrial laser scanning for standardized forest inventories. ISPRS - Int. Arch. Photogramm. Remote Sens. Spat. Inf. 36: 8/W2. Available online at http://www.isprs.org/proceedings/XXXVI/8-W2/THIES.pdf. Last accessed 28 January 2011. Wezyk P., Koziol K., Glista M. and Pierzchalski M., 2007. Terrestrial laser scanning versus traditional forest inventory: First results from the Polish forests. In: Proc. Laser scanning 2007 and Silvilaser 2007. ISPRS Commission III Workshop, Vol. 36, Part 3, Espoo, Finland, Sept. 12–14, 2007. Available online at http://www.isprs.org/proceedings/XXXVI/3-W52/final_papers/Wezyk_2007.pdf. Last accessed 28 January 2011. Xu H., Gosset N. and Chen B., 2007. Knowledge and Heuristic Based Modeling of Laser-Scanned Trees. In: Proc. of the 2007 ACM Transactions on Graphics. Available online at http://portal.acm.org/citation.cfm?id=1289603.1289610. Last accessed 2 November 2010.